Why pick the Florida Safety Council when there are numerous driving schools throughout Florida? 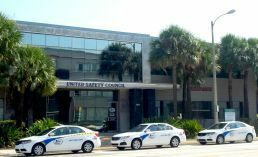 The Florida Safety Council is a non-profit organization that has been serving Florida since 1953, providing driving school, traffic school and other safety training and education services. Driver safety is one of the cornerstones of the Florida Safety Council's education and training initiatives. All of our Driving School instructors are experienced and certified by the State of Florida. Our Driving School Instructors take pride in what they do, with years of experience, and from varying backgrounds including, police officers, teachers, and fire fighters. The Florida Safety Council Driving School has an excellent track record of service throughout Florida, and looks forward to serving you.